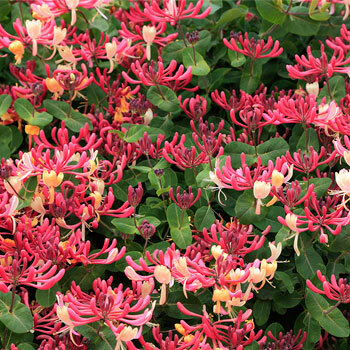 Deer resistant and drought tolerant, this non-invasive honeysuckle will attract butterflies and hummingbirds with its sweet scent and unusual blossoms. Great as a specimen trained onto an obelsik or over an arbor, or for covering eye sores such as tree stumps, just be sure to provide plenty of room when arranging any neighboring plantings. Space 3-4' apart, or a few feet more if using as ground cover. Prune back after flowering to maintain size as needed. Watering Details: Drought tolerant—1" every week or so is plenty once established. An inch per week until then is best. Fertilizer: Scratch in 2-4" of compost prior to planting, and top-dress with about 1" every spring thereafter. Flowering: White, yellow, and pink sweet smelling blossoms curving upward in a sea anemone-like fashion. Seeds: Flowers will turn into translucent red berries.